Abstract: Under the premise of enhancing the user experience, the 14-year Airwheel new wheelbarrow Q5 intentioned, making the vehicle highlights outstanding, detailed article will introduce you to the characteristics of the Q5 at Airwheel wheelbarrow. And electric wheelbarrow same basic performance Airwheel before, objectively speaking, in terms of performance, Q5 and did not give us much of a surprise, is still the world's top high sensitivity smart chip, quiet life long maglev motor , shell material like no big improvement, is still strong and drop new high-tech nano-plastic, aluminum foot. But Airwheel rover is so powerful, capable performance parameters under the same circumstances, the Q5 build into a "new" market latest wheelbarrow, those R & D personnel were moved Airwheel details at the hands and feet, in the end, what does? Both sides of the body Q5 more red lights! Just press the power switch, LED colorful flashing lights will very regular. As the cool wind pulled the wheelbarrow, car body increases the LED lights for the car itself is the increase in individual elements, in fact, and those posted to a variety of paper flowers wheelbarrow indifference, but in addition to good-looking LED, there are important a role: warning. When riding at night, LED Bright lights can serve as a warning to some extent, to eliminate the potential danger. So, a bright light is double benefit, can increase wheelbarrow appearance, but also ensures the safety of the vehicle. Q5 foot widened to increase the use of circular design, allowing users easy ride when the stampede, the situation will never happen falling, and the square, and in the past different, Q5 foot with the arc-shaped handle, convenient foot when security situation does not occur bruised bump. Q5 balance wheel car for the convenience of users of parking, particularly increasing the foot brake, wheelbarrow in the past, can only turn on the power when parked or parked against the wall, if it is in the open spaces the wheelbarrow fell to the ground can only be parked. With the foot brake can put wheelbarrow normal park, convenient and practical. Q5 electric wheelbarrow position in the legs increases the natural silicone gaskets, brilliant colors, and can be replaced, on the one hand to enhance the usability, aesthetics, another easy ride when you can protect the rider's legs, to reduce tingling legs to stand up riding for a long time because the phenomenon caused by the care of the rider's legs. 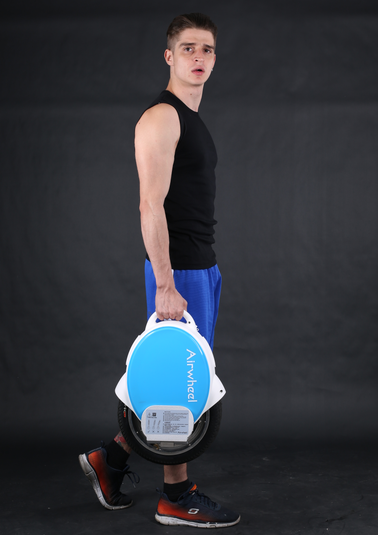 More of these improvements are the basis Airwheel electric unicycle on strengthening, and compared to the previous Airwheel electric wheelbarrow, no significant difference in performance, but the details really do a very good place, for consumers bring more convenience. Brand awareness higher brand prices are between 2000-3000, the price of a normal part of the electric unicycle price range, but for consumers, it is also one of the most tangled price range, how to choose, or to see their it.